Dandelion plant, Taraxacum officinale, is an exceptionally useful culinary and medicinal plant. Rich in Vitamins A,B,C and minerals. The leaves are used raw in salads, and steamed as a vegetable. The roasted root is used as a coffee substitute. A blood and liver tonic, the leaves are also approved by German Commission E as a remedy for gall bladder problems, kidney stones liver problems, urinary tract infections and poor appetite. Used as an Ayurvedic medicinal herb. Dandelion was probably one of the bitter herbs used by the Jewish faithful in the Passover meal in Biblical times. Flower petals have been used as the base for making Dandelion wine. 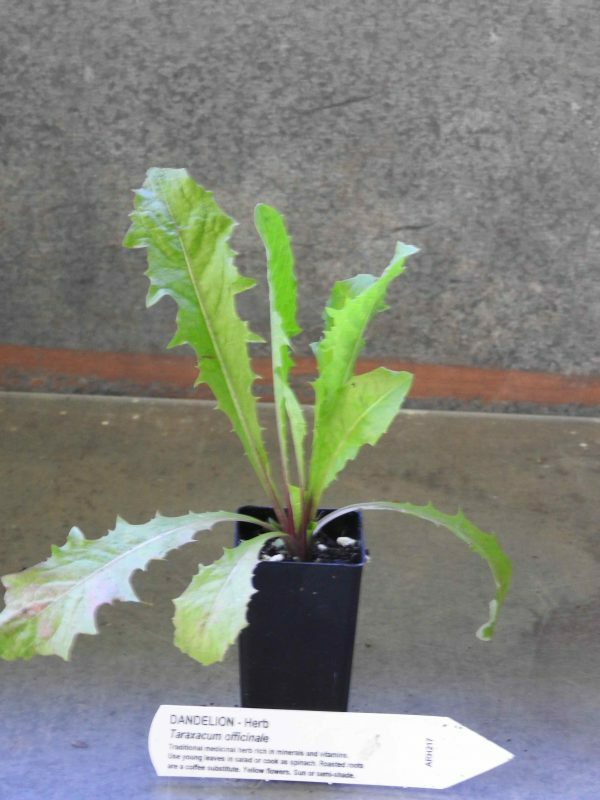 Dandelion plant is a native of the Northern Hemisphere and is adaptable to most soils and positions. Sunny yellow flower heads produced in spring. Drought and frost resistant. A perennial plant, growing to 0.3m x 0.2m. Be the first to review “Dandelion, plant” Click here to cancel reply.